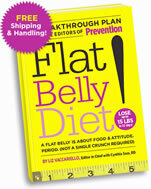 The Flat Belly Diet is written by two editors from Prevention magazine. Liz Vaccariello and Cynthia Sass have modeled their diet around a traditional Mediterranean diet. The diet claims that – not only will the scales go down – but “[…] it targets the second type of fat–visceral–which is much more dangerous and difficult to lose”. The Flat Belly Diet is based on monounsaturated fats (also called MUFA: Monounsaturated Fatty Acids). Every meal should have a MUFA component (that ideally replaces the saturated fat content). Meal plans are set at 1600 Calories per day. Look for low Calorie meal ideas here. Canola oil, flaxseed oil, olive oil, peanut oil, pesto sauce, safflower oil, sesame oil, soybean oil, sunflower oil, walnut oil. The program recommends exercise – and provides a series of cardio workouts, and full body resistance training exercises. However the marketing of the diet claims “no exercise required”. These exercises could be used with the Flat Belly Diet. This market-speak is simply designed to sell product – without any firm evidence to back it up. Provided the marketing material is not taken too seriously, this is a healthy diet, and, when followed will probably result in weight loss. The claim that it will specifically target visceral belly fat seems to have little basis in research however. This author also has another version for those with digestive issues. The book is available for $25.95. There is also a cookbook for $27.95. Cholesterol reduction using manufactured foods high in monounsaturated fatty acids: a randomized crossover study, British Journal of Nutrition, Vol 81 Issue 6 Jun 1999. Williams et al. a problem belly fat.pls help me.i want a diet that easy to follow. You can check out my comment under Banana Diet here in this website. i need to loose thirty pounds. fast! can someone help? Im perfectly fine with my weight. i just have a pouch under my belly button that sticks out. and i cant stand it. ive been doing crunches and all these ab workouts and nothing is working. help! i went out and brought some opti fast shakes. for breakfast i would have cereal, and luch i would have a salad and for dinner i had my shake…. and i also did sit ups and stuff before my bed time shower. it has been a week so far. and i now fit in to my uniform. woo. how ever im still a tad over weight so i will be trying the three day diet. my mum did it and lost ALOT of weight. so i am hoping it will work for me too!! This Diet really works! My Mum did in order to obtain,and maintain the flat belly you have to make this water it is call the sassy water a jug of water with lemons, ginger, and fresh mint drink 8 glasses each day,and it will flush away belly fat TRUST ME PLEASE TRY IT IT REALLY WORKS! the basic is easy, eat monounsaturated fat. Hey, im 14 and my height is 5ft6 nd i weigh 130pounds i know that’s healthy but i just want to know is it the normal weight for someone my age?? im juat really confused can anyone help.. Try the 3 day diet. It is healthy and balanced and you do lose weight. Just use for 3 days and watch your eating for the rest of the week and do it again the next week and your weight will be shed. I really want to lose my belly fat,tell me how. I need to 10lbs and would like a flat belly this will be my first time dieting what you suggest would be a good diet to try? Its just wrote out in plain English that everything they are saying and your still gonna try this one??? Why? I’m going to try this flat belly diet and see how it works for me. I need to lose 15lbs in 5 days….can it be done? i really need to shed the pounds! i need a diet that will work for me. i hate when my thighs stick together. i hate having to wear the plus size juniors. i need help!!! i want a diet that is easy to follow that will gove me a body like a model and i feel that this diet is hard to understand and that it should be layed out easier.